Do your young children scribble or pretend to write? Good! That’s a terrific sign that they are on the road to becoming readers and writers. 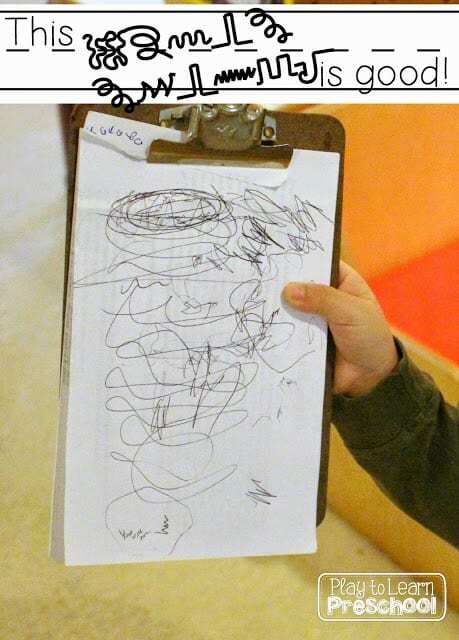 When young children scribble, they demonstrate how much they know about print. They are practicing important fine motor skills and strengthening their hand muscles. Learning to write is a developmental process, much like learning to talk, walk or read. It goes through a series of stages that will eventually lead to writing sentences and stories in elementary school. In preschool, we support our students’ development by giving them lots of time and opportunities to write. They have free access to paper, markers, crayons, and pencils at the writing center. 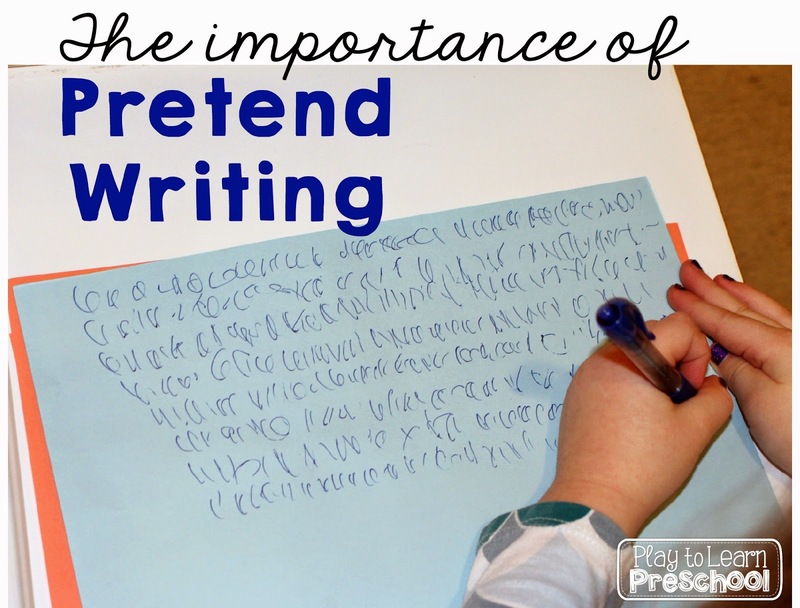 To some people, their attempts at writing might seem like “scribbling” but the truth is, pretend writing is an essential and important step in learning to write. 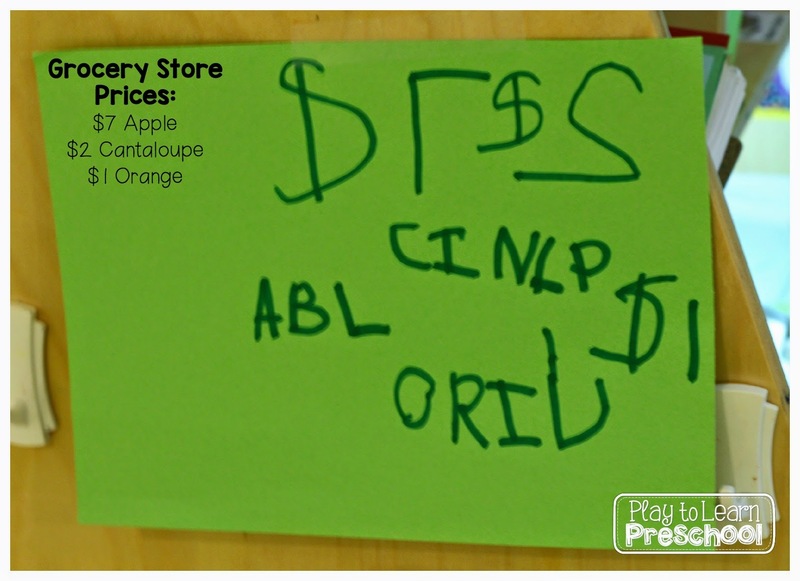 When young children pretend to write, they show that they understand directionality. This little girl made her writing start in the top left, and go across the paper to the right, and then start again on the next line. Preschoolers who pretend to write are showing that they know that print has meaning. That’s huge! We can say something and write it down, then others can read what we have written. Wow! Recently, our dramatic play center was set up to be an Airport. The students had different roles in the center. This little guy was the travel agent, responsible for issuing tickets for our Play Air flight 123. He took down my information, and then gave me this boarding pass. I’m not sure exactly where I was headed, but the ticket got me on the plane! As our students get closer to the end of preschool and have an eye on kindergarten, their writing becomes more conventional. This little one is in the process of figuring out that there are spaces in between words. Look at the example above. 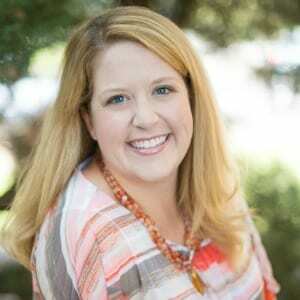 She puts a period, an “S” for “Space” and a dash between her first name and her last name. There’s also a period at the end for good measure. In the example below, she has reduced it to just a dash. Soon, a small space will be sufficient for marking the difference between the two words. Another important thing that young children learn through pretend writing is that their words have power. These boys wanted to make a “Sign” to claim ownership over the puzzle they were working on. 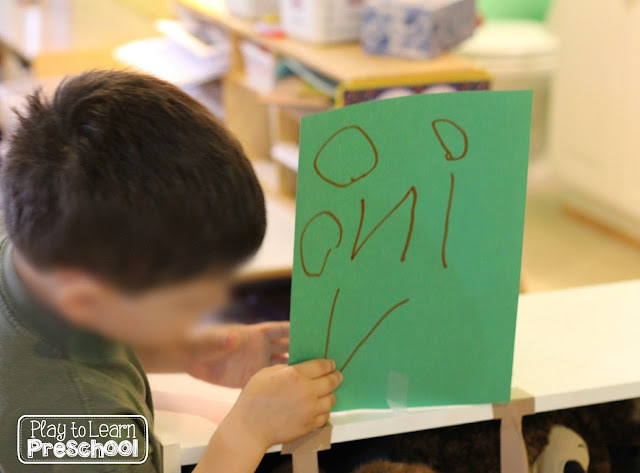 Our preschoolers really love to make signs! Here’s another one, by a Pre-K student. A group of students made the sign below to hang in our grocery store. If anyone doubts the power of play-based learning in a literacy rich environment, this picture speaks volumes about what our preschoolers are learning while they play! An important part of our job as teachers is to share information about child development with parents. When parents know how important pretend writing is, they can encourage and support it at home. This hand-out is a great way to share the stages of writing. This ^^^ is good! This ^^^ means that your students are learning that print has meaning. This ^^^ means that they are on the road to becoming writers!